Every month, some of Silicon Valley’s biggest power players meet at the Palo Alto home of Chamath Palihapitiya, an early Facebook executive who now runs his own venture capital firm Social+Capital. 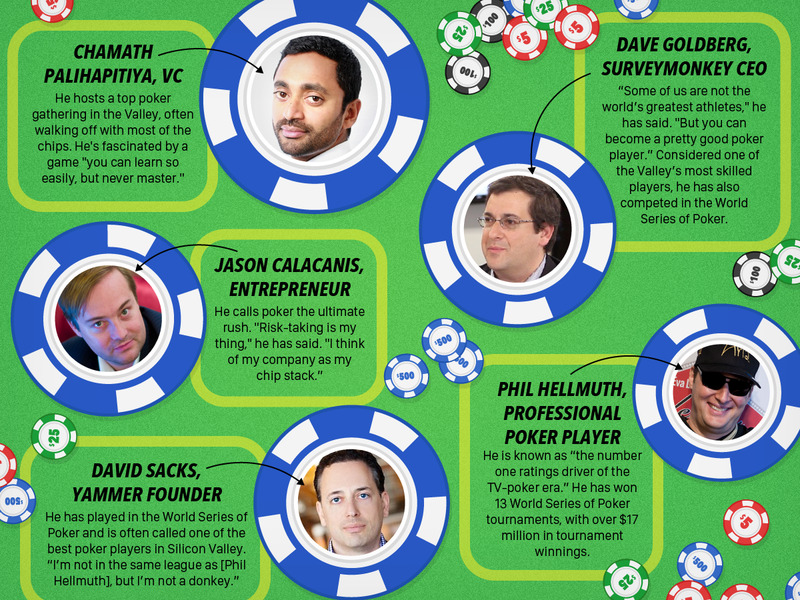 The guest list reads like a who’s who of Silicon Valley’s true elites: from Yammer founder David Sacks, SurveyMonkey’s Dave Goldberg and Inside.com’s Jason Calacanis to professional athletes and poker players, including the World Series of Poker champion Phil Hellmuth. But this isn’t for some networking or investment opportunity of a hot startup. They meet for something much more fun: a game of poker. The level of play is far beyond regular amateur tables. For example, Palihapitiya, who often walks off with the most chips, has played in some of the highest stake poker tournaments, including the World Series of Poker, where he finished 101st out of more than 7,000 contestants in 2011. In fact, according to Hellmuth, a 12-time world champion in Texas Hold’em, the skill level is so high that he was only able to hit break-even in the first three years he played there. 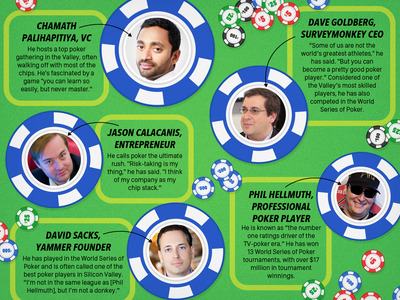 “In general, great businessmen are great poker players. There’s a reason these guys made so much money in the real world. Those skills translate to poker,” Hellmuth tells us. “In general, great businessmen are great poker players. There’s a reason these guys made so much money in the real world. Those skills translate to poker,” Phil Hellmuth says. Once the game starts, the intensity could easily turn up in a matter of seconds. They play for hours, well past 2AM on some occasions. And while the stakes remain relatively modest, $US10,000 bluffs do happen in the most heated moments. Poker has relatively simple rules. In traditional Texas Hold’em poker, each player is first dealt a set of two cards, which are not shown to others, and then a shared pile of five cards on the table. The first three of the five shared cards are dealt at once, and after a round of betting, the fourth card is shown. The fifth card is uncovered after another round of betting. But, in between each round of betting, there’s intense strategy and mind-games involved that requires a lot of intellect and discipline throughout the game. That’s what makes poker such a complex — and fascinating — game, Palihapitiya says. There’s a chance of overcoming a poor hand, if you play it smart. Or you could lose everything with a single mistake, just when you thought you were going to win a big hand. Depending on how you play each round of betting, you could completely change the outcome of the game — regardless of what cards you are dealt at first. It’s just like being born into terrible circumstances in life but finding ways to overcome that and succeed. Palihapitiya relates to it personally, as he is a classic “rags-to-riches” story, having grown up on welfare as an immigrant in Canada to become one of the most successful tech entrepreneurs around. “That’s a characteristic of this game that very few games have,” he says. You make plenty of mistakes in poker. The point is learning from those mistakes and fixing it in the future. “When you misplay your cards and lose a big hand, it’s an unbelievable moment of learning,” Palihapitiya says. It’s one thing not to repeat the same mistake, but it’s also important to know when you win by sheer luck. “Sometimes you just do something and it completely works, and you think to yourself, ‘I must be really good.’ The takeaway should be the exact opposite — you may have just gotten really lucky,” Palihapitiya says. The best poker players have an exceptional ability to sense others’ emotional energy. They can read how people feel or think by just looking at their reactions to certain moves or body gestures. Palihapitiya says that ability can help you in everyday life, too, as you become “more emotionally attuned to the people around you.” In other words, you can start understanding others better, coaching people better, and even negotiating better. An average person’s life spans 80 to 90 years. Most startups are on a five-to-seven-year trajectory. A single round of poker, however, happens in a matter of just a few minutes. “Every hand in poker is a microcosm of that entire struggle (of life or a startup),” Palihapitiya says. You have to make quick decisions — and take risks — in a short period of time, with very limited information, and those decisions could have a huge impact on the outcome of the game. It’s why good poker players know how to make the right decisions quickly and take risks when needed. Palihapitiya, who at age 26 was the youngest VP in AOL’s history, says he doesn’t have enough time to play poker as much as he used to anymore. But he still tries to tell others how great the game is through charity events, which many of his Silicon Valley friends join in together. For example, he donated all of his winnings from the World Series of Poker to the Boys and Girls Club, while he’s been hosting a number of different charity poker games that generate roughly $US6 million a year.